Butler County Assistant Prosecutor Greg Stephens was recognized by the DEA for his involvement in bringing an indictment against major marijuana trafficking conspirators during his tenure with the U.S. Attorney General's Office in 2012. The case involved 11 co-defendants, including the head of the organization, Mark Wurzelbacher of Butler County. 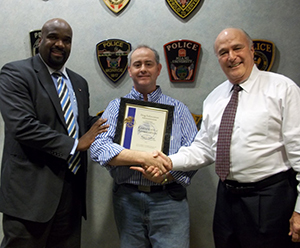 Assistant U.S. Attorney Ken Parker, Criminal Chief of the U.S. Attorney's Office, surprised Stephens with the award on Friday, March 22, 2014, during a visit to the Butler County Prosecutor's Office. "The case resulted in the forfeiture of approximately $400,000 from multiple defendants as well as several rental properties in Butler and Hamilton Counties that were used to launder drug proceeds, two boats and other items," stated Parker. "Greg's hard work on this case was invaluable to our office in obtaining the indictment. " "We are proud of the work Stephens did while he was on loan to the U.S. Attorney's Office," Prosecutor Mike Gmoser remarked. "But we are even more proud that he is back with us and brings additional experience and knowledge to our office so we can better serve the citizens of Butler County."